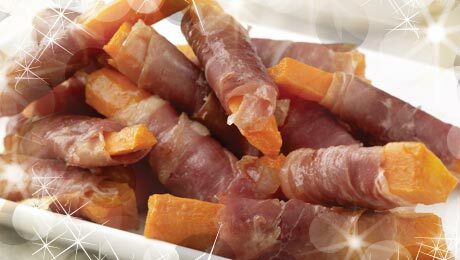 These tasty carrots will brighten up your table, you can substitute the Prosciutto with some streaky bacon or Pancetta. If you prefer baby carrots wrap each individually in the pancetta instead. 1. Place the carrots in a small pan and cover with some water, blanch for 4-5 minutes. Drain the carrots and wrap in the pancetta, then place on a baking dish. Add the butter and honey to the baking tray and season with some salt and pepper. Place in the preheated oven and baste once or twice during cooking which will take about 30 minutes.